The United States National Geodetic Survey (NGS) has embarked on a ten year project called GRAV-D (Gravity for the Redefinition of the American Vertical Datum). The purpose of this project is to replace the current official vertical datum, NAVD 88 (the North American Vertical Datum of 1988) with a geopotential reference system based on a new survey of the gravity field and a gravimetric geoid. As part of GRAV-D, the National Geodetic Survey plans to execute a set of “geoid validation surveys” at various locations of the country. These will be surveys designed to independently measure the geoid to provide a check against both the data and theory used to create the final gravimetric geoid which will be used in the geopotential reference system. The first of these surveys, known as the Geoid Slope Validation Survey of 2011 (GSVS11) was executed between July and October, 2011 in the west central region of Texas. The survey took place over a 325 kilometer line running more or less north-south from Austin to Corpus Christi, Texas. Measurements were taken at 220 marks (one per mile) and included static GPS, RTN GPS, geodetic leveling, astro-geodetic deflections of the vertical using the Swiss DIADEM camera, absolute gravity, gravity gradients and LIDAR. This region was chosen for many factors including the availability of GRAV-D airborne gravity over the area, its relatively low elevation (220 meter orthometric height max), its geoid slope (about 130 cm over 300 km), lack of significant topographic relief, lack of large forestation, availability of good roads, clarity of weather and lack of large water crossings. This talk will outline the results of the survey, specifically the comparison of various geoid slopes over this region: gravimetric geoid models (with and without airborne gravity), minimally constrained GPS and leveling and from astro-geodetic deflections of the vertical. In addition to a variety of interesting conclusions that came from the multi-technique survey, GSVS11 conclusively proved that the addition of recent GRAV-D airborne gravity data reduced the errors in gravimetric geoid models in this region to 1 cm over all wavelengths from 0 to 325 km. 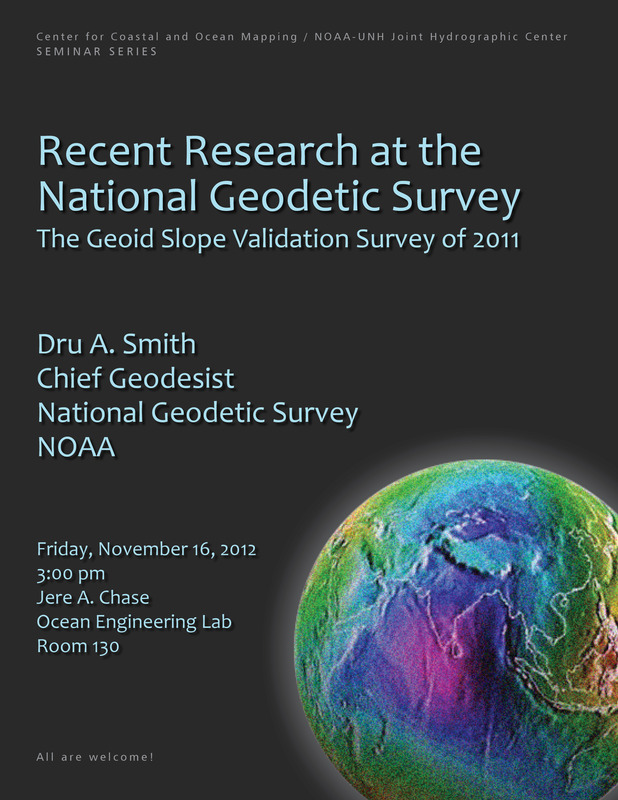 Dr. Dru Smith has been the Chief Geodesist of NOAA’s National Geodetic Survey since 2005. He first entered NGS in 1995 after receiving his Ph.D. in geodetic science from The Ohio State University. His original job with NGS was in geoid modeling. He has also been active in developing U.S. GPS policy and modeling the ionosphere using the CORS network. In 2008 he led the development of both the NGS 10 year plan and the GRAV-D plan. He is currently working on research to improve the efficiency of tying historic passive control surveys to the CORS network. In 2012 he received the Department of Commerce's Gold Medal for Individual Scientific Achievement for his design and leadership of the Geoid Slope Validation Survey of 2011. Graduate Faculty of Texas A&M University. He serves on the Board of Directors of the Conrad Blucher Institute for Surveying and Science and has previously served on the Board of Directors for the American Association for Geodetic Surveying.